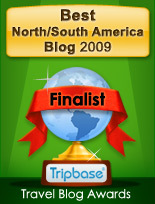 Feb. 18, 2008 – When North Americans fall in love with Mexico, and with their own lives here, it affects them in many ways. Some blog or do little videos for places like YouTube. A large number of my friends here have taken up painting. Some are active in fundraising for orphanages, animal shelters, and other causes. Still others roam the country or just laze contentedly by the pool, happy to have their major achievement years behind them. And while you’re there, you can find out more about her and the project. By the way, if you watch the short trailer from the film, you may notice that the lip movements are not in synch with the words you hear. I asked Caren about that and she said it’s a problem that can occur in transferring a film to video. Lost and Found in Mexico will be playing at the Festival Internacional de Cine en Guadalajara, which takes place from March 7 through the 14th. Copies can also be purchased from the website. Do take a look at her site, specially if you are wondering if living in Mexico might be for you!